During the last 10 years, Pakistani Governments have underperformed. The situation has not been much different in foreign policy. One of the primary reasons for the predicament has been the nature of Pakistan’s civil-military relationship, plagued by mutual distrust. The position was hardly better when it came to Pakistan’s engagement with the Gulf States. During the five years of the Pakistan People Party’s (PPP) Government, there was a perception within Gulf circles that it was pro-Iran. Close ties between the Gulf countries and the Pakistani security establishment saved the relationship from total breakdown. In the next five years under the Nawaz Sharif Government, there were initially promising signs of reconciliation, but the goodwill ended once Pakistan decided in 2015 against joining the Saudi-led campaign in Yemen. During the first three months of its tenure this year, Imran Khan’s administration has adopted a strategy of continuous engagement with the polities in the Gulf, with the Pakistani premier twice visiting Saudi Arabia and the United Arab Emirates. The response, in financial support and commitments towards investing in the country, suggests a willingness to move forward towards a closer relationship. A key diplomatic success for the new government has been resetting Pakistan’s relationship with the UAE. Bilateral ties had nosedived in the last five years, amid the Emirates’ major role in the Yemen intervention. The two sides got into a war of words when the Emirati Deputy Foreign Minister, Anwar Gargash, criticized Pakistan’s refusal and implied the country’s political position was more in line with Iran and Turkey. Pakistan’s Interior Minister Nisar Ali Khan rejected the criticism, deeming it an insult and a violation of diplomatic norms. The Emirates revised their policy towards Pakistan, warming to India. The Emirati Crown Prince Sheikh Mohammad Bin Zayed was chief guest at last year’s Republic Day military parade in Delhi. The presence of a large Indian expatriate community in the Gulf, and India’s rise as a new economic power on the world stage, also contributed to the UAE’s realignment within South Asia. The breakdown in ties was also linked to the intra-Gulf feud between the UAE and Qatar at one end. Amid tensions between Turkey and the Emirates, the former Pakistani government developed exceptional ties with Turkish President Recep Teyyip Erdoğan and the Qatari royal family. In the wake of the Panama Papers investigation into former Pakistani Prime Minister Sharif, Emirati authorities fully cooperated with the investigative commission formed by the Supreme Court of Pakistan and provided it with Sharif’s work permit, which ultimately led to his disqualification. 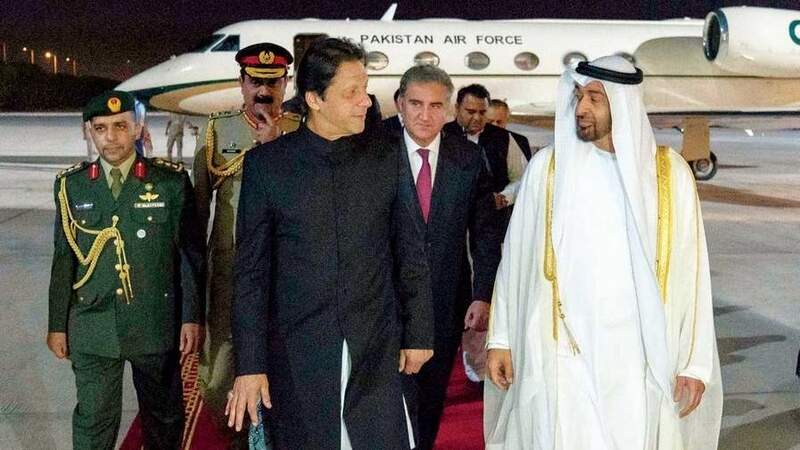 During Imran Khan’s first trip to Abu Dhabi, the presence of the Emirati Crown Prince at the airport to receive him personally meant a thaw in ties was at hand. The visit of a high-ranking Emirati business delegation, exploring ventures for bilateral trade and investment, followed. Particularly revealing were the words of Pakistan’s Information Minister, who suggested the two sides had been working together for some time to chalk out details of an economic package amid Islamabad’s difficulties. Now, Imran’s second visit to Abu Dhabi has brought a long-term strategic economic partnership. The progression in bilateral ties will further help Pakistan in restoring a regional balance of power that had started to favor India. NextSyria Daily: Reconstruction? Not in East Aleppo….